From the moment the "open house" door officially opened on March 4 at SMILE Station, the conversations about cut-through traffic to and from the Sellwood Bridge using neighborhood streets were lively – as participants discussed the city's proposal to add speed bumps in several places in Sellwood to address the issue. The Sellwood Moreland Improvement League's (SMILE) Transportation Committee Chair, Scott Kelly, greeted the arrivals as the room filled with neighbors: "At this open house we're inviting people to look at the Portland Bureau of Transportation (PBOT) 'Tacoma Street Neighborhood Traffic Management Project', intended to address some of the safety aspects of cut-through traffic." 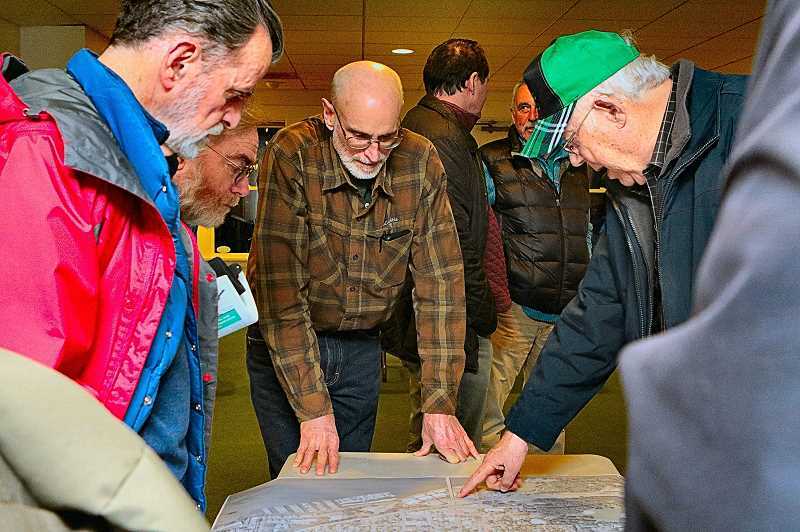 "Neighbors have not expressed a consensus on how to best reduce cut-through traffic in the neighborhood; what would be good for one street might not be good for the next one," Kelly said, while neighbors looked at poster-board exhibits, and a large street map of the affected area laid out on a table. "So, this is not about reducing cut-through traffic, necessarily; instead, the hope for the project is to slow down vehicle drivers as they travel our residential streets," Kelly told THE BEE. "I don't think that PBOT can really cut down the traffic because it's not possible to cut off all traffic coming into the neighborhood." In "Phase I" of this project, speed bumps will be added to S.E. Miller, Nehalem, Umatilla and Linn Streets, from 6th Avenue to 11th Avenue; and also along S.E. 9th and 11th Avenues from Lexington south to Linn street. "Why speed bumps?" was the question posed by many of the 45 participants who attended the open house. After looking over the materials and talking with PBOT staff, Chris Norman, a neighbor at S.E. Umatilla and 13th Avenue, questioned aloud, "I understand speed bumps can reduce speed; but where is the data that shows the efficacy that they redirect traffic, and if they do, by how much?" Kirsten Leising, who said she lives on S.E. Miller Street between 13th and 11th Avenues commented, "I wish speed bumps were not the only solution; they're really loud, and they don't always slow traffic down. I'm voting for perhaps putting in more one-way streets, and more stop signs." But, the current project is focused on speed bumps, which will be installed "Summer/Fall 2019". About six months after they go in, PBOT will collect data to assess changes in traffic conditions and patterns in the area. If deemed successful, PBOT will go ahead planning more speed bumps for area streets. And if not – other solutions may be considered.